Sunday 3rd September. Arun Crossings Ride. This DA Event was our Sections second of the year ably organised and led by Colin. I joined Colin at the start at Pulborough Station with Avryll and Gill. Alan and Liz and Nicola did part of the route generally in the opposite direction. Gill rode on road but joined us for part of the route in the afternoon. 4 members from Arun Adur and 2 from Horsham joined us. Weather started dismal and drizzly but soon dried up with bright sunshine by the afternoon with temperatures up to 23C. Colin led us on a very good route with many rough tracks and lanes many of which were new to us. Despite the area being well known to us by road the tracks added a new dimension and many of us had no idea where we were most of the time. The ride took last years route but in the opposite direction and with the addition of some tracks we had not tried before. We completed 12 crossings of the River Arun during the day. We headed for Penelopes at Wisborough Green for 11s but that was closed for redecoration so we diverted to Fishers Farm nearby. 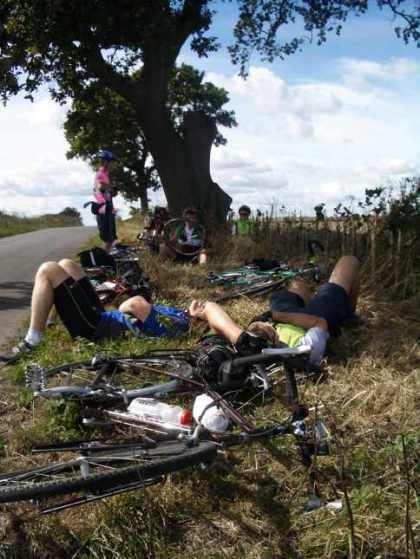 Soon after elevenses Dave Fox had a fall from his bike and very adroitly scrambled clear of an approaching car. He was none the worse apart from minor cuts. We continued on many more tracks to stop at the Haven for Lunch. We were joined there by a large group from Horsham Section who came direct by road. 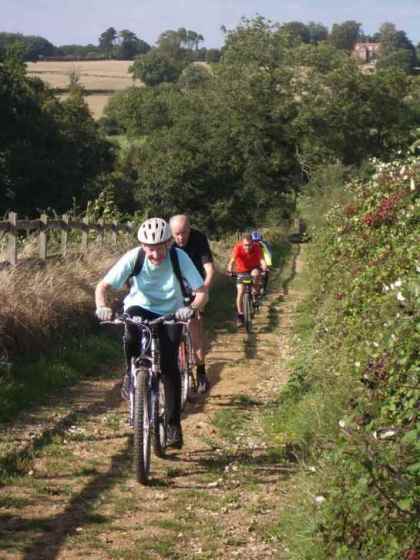 Tea was taken at Fishers Farm and then a convoluted route back to Pulborough. I didn't have a Bike Computer but the route mileage was approx. 30 miles. Sunday 27th August: Stansted from Chichester Cross. 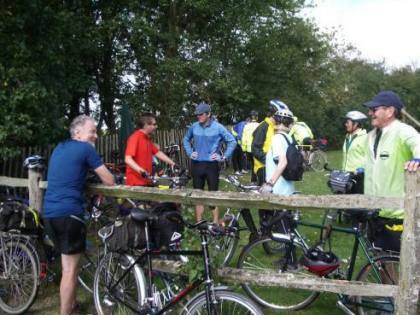 There was a good turn out for this, with members of the Moulton club accompanying the ride. We decided to head to Stansted instead of Petworth to try and avoid bank holiday traffic on the main roads. We set off from Chichester Cross in brilliant sunshine. It was an odd day weather wise as it was warm in the sun but chilly in the shade, so it was difficult to decide what to wear when cycling. We headed west out of Chichester and across the level crossing, travelling via backroads through Fishbourne, Hambrook and Southbourne before having elevenses at a cafe by a marina on Thorney Island. After elevenses we set off north to Stansted House cafe via Emsworth and Westbourne. Upon arrival we enjoyed eating our meals outside even though it was fairly windy by that point! The other riders had afternoon tea at Fishbourne Roman Palace tearoom, however I headed straight home after lunch. My mileage for the day was 69km. Our good luck with the weather continued this weekend. Heavy rain overnight had cleared by the time we were ready to leave. The day was mainly sunny about 21C and with the added benefit of a 25 mph tail wind all the way home. John again found some quiet byroads out of Andover and east to Whitchurch where we stopped in a Pub for a coffee. A little further on I gained the first puncture of the day which Mary decided was a good spot with some nearby Blackberry bushes. We continued via Micheldever and more back roads before Sam gained the next puncture. Score for the weekend at this point was 3 all between Sam and me. 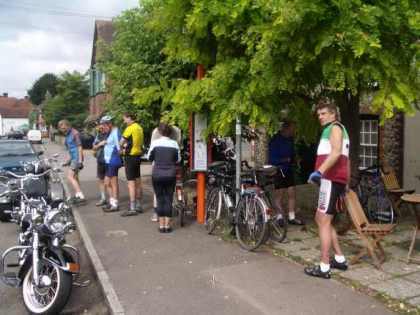 We continued to stop for lunch at Tichborne a mile south of New Arlesford. 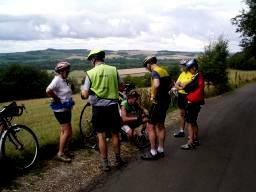 The afternoons ride took us through Cheriton and then a long climb to the Downs. As we were starting off I needed to stop with other riders in front and unclipped the usual left foot but then overbalanced to the right and failed to get the right foot out in time resulting in a fall and a few cuts on the arm. After being suitable patched up we continued on scenic byroads with great views across rolling downland. We continued across to the Ridge road from HMS Mercury above East Meon where Sam gained the 3rd puncture of the day, final score now 4 to 3 in favour of Sam for most punctures. This was a suitable spot for a snooze in the sunshine and also to hunker down out of the wind blasting across the ridge. We continued via Chalton to stop for Tea at Rowlands Castle. 63 miles back to Chichester and my mileage back to Pagham was 68.